January 21, 2017: Both Free and Pro versions are not working. The key issue is fixed and we are working on couple improvement. The updated app will be submitted to the App Store soon. This is a free version with limited features and alerts. For full features and TVOS App, please look for the Pro version. > By default, alerts are loading once the app is launched. Earthquake Alerts are listed based upon "Date". Once alerts are loaded, you can select "Importance" on the top to list the alerts based upon the severity. Select any alert to see the alert details. > Launch the Watch App and the app will communicate with the iOS App to get the nearest Earthquake information and also notify the iOS App to select and view the Earthquake. Click on the "Nearest Earthquake" button if you would like to search the nearest Earthquake again. 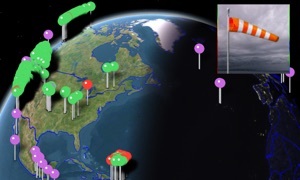 - The first app to integrate both World Earthquakes and the latest national Radar images together. 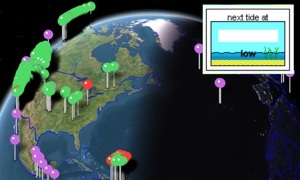 - The first app to provide World Earthquakes and Radar images in 3D view.